2 Preheat oil to 400 degrees F. Depending on the amount of oil, outside temperature and wind conditions, this should take about 40+ minutes. Meanwhile, remove turkey from the brine and discard brine mixture. 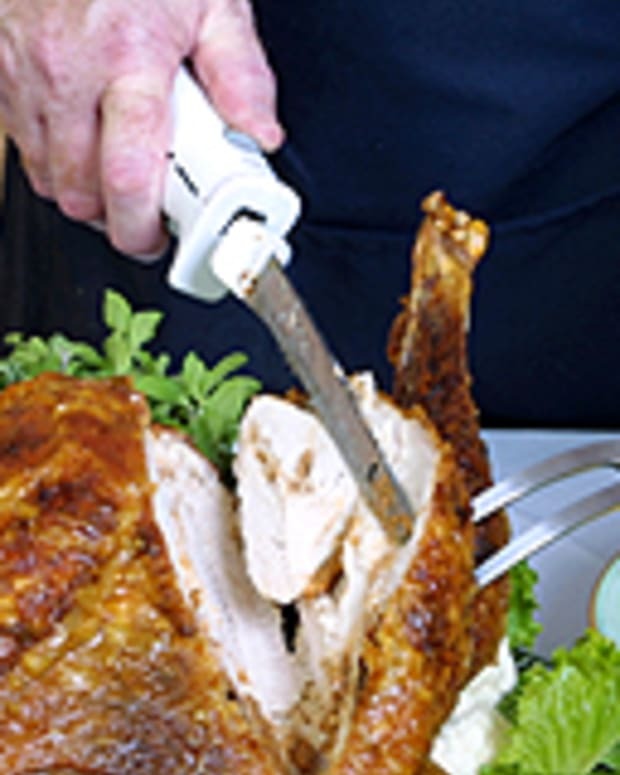 Rinse turkey well with cold water; drain cavity. Dry turkey well with paper towels. 3 ake care to dry both inside cavities. To allow for good oil circulation throughout the cavity, do not truss or tie legs together. Place turkey, breast side up, in basket. Slowly lower basket into hot oil; be cautious of splattering oil. 4 The level of the oil will rise due to the frothing caused by the moisture from the turkey but will stabilize in about one minute. 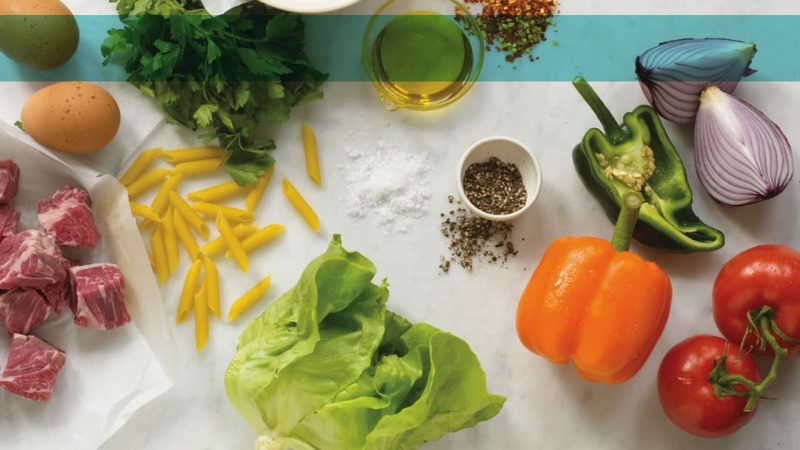 (Safety tips: to prevent burns from the splattering oil wear oven mitts/gloves, long sleeves, heavy shoes and even glasses. 5 It is wise to have two people lowering and raising the turkey.) 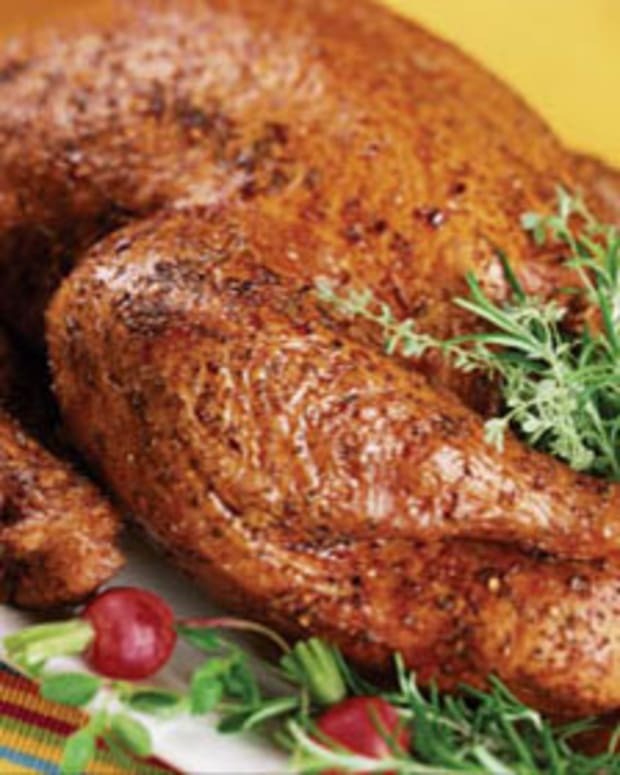 Stay with the cooker at all times as the heat must be regulated to maintain 350 degrees F. If the temperature drops to 340 degrees F or below, oil will begin to seep into the turkey. 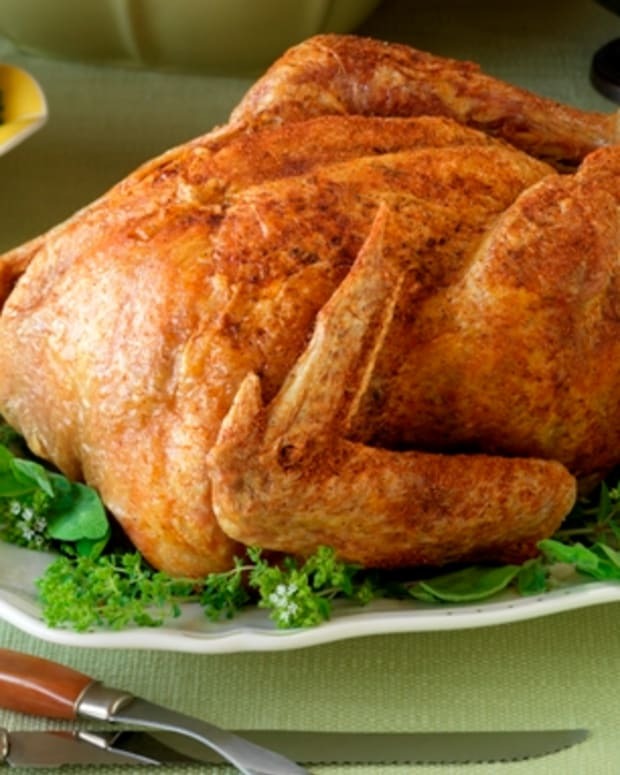 6 Fry turkey 3-1/2 minutes per pound. 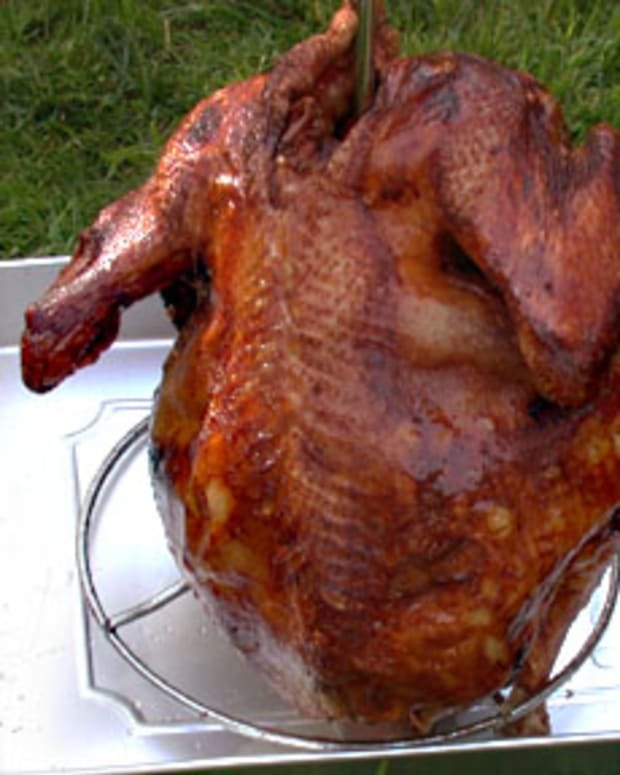 Remove turkey from oil to check doneness. 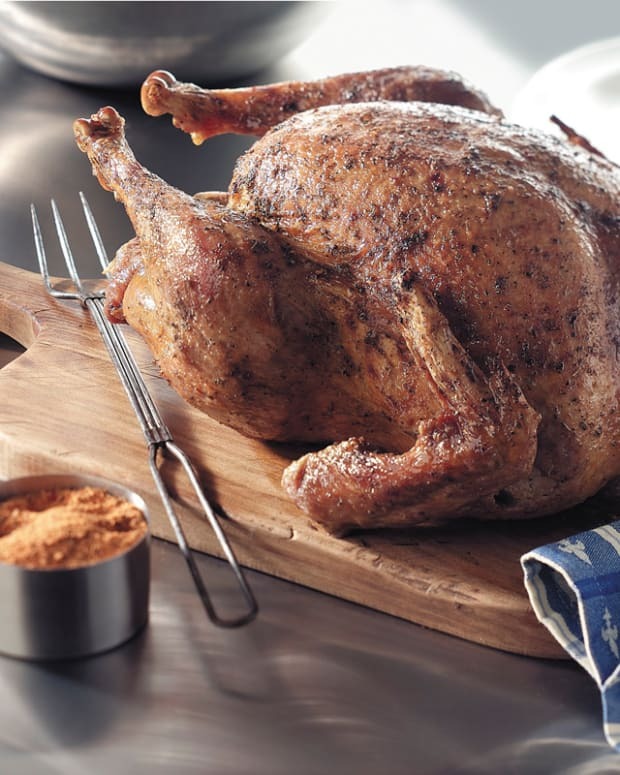 Insert an instant-read thermometer in the meaty part of the thigh; it is done when it reads 170-175 degrees F. Carefully remove the turkey from the hot oil and drain on paper towels. Let rest 15 minutes. 7 NOTES: Use only oils with high smoke points, such as peanut, canola or safflower oil. 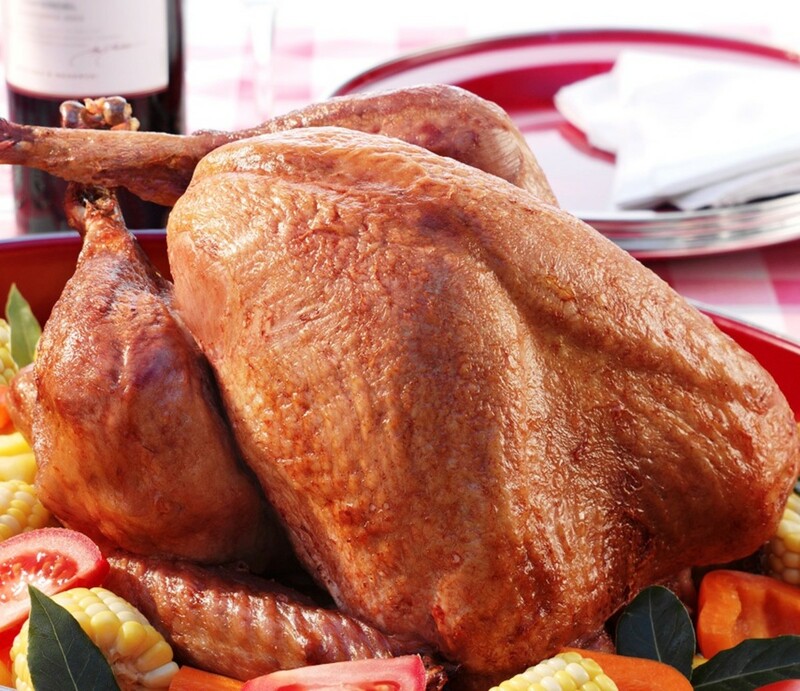 To determine the correct amount of oil, place the turkey in the pot before adding seasoning and add water until turkey is covered. 8 turkey out of the water before marking the oil level. Measure the amount of water and use a corresponding amount of oil. Dry the pot thoroughly of all water.